Francis Hamilton and Nancy Zeno-Hamilton, from left, are handing over the running of Thanks to Give to sisters Melody King and Melissa Hannebrink. The total cost of this project is about $1,700, organizers say. Donations can be made by mail or in person at EA Family Services, 525 Sutton Way, Grass Valley, Calif. 95945. Make checks out to EA Family Services but designate Thanks to Give on the memo line. For more information, call 520-278-5050 or email thankstogivegv@gmail.com. 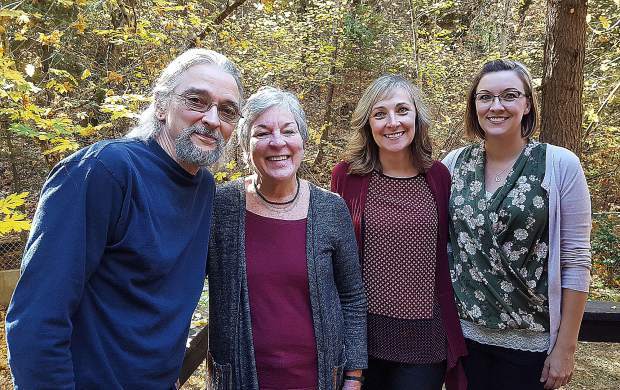 For 19 years, Thanksgiving morning for Nancy Zeno-Hamilton and her husband, Francis Hamilton, has meant rising at the crack of dawn to oversee the preparation and delivery of hundreds of meals to shut-ins and others in need in Nevada County. This year will be slightly different, however, as they hand over the reins of Thanks To Give to sisters Melissa Hannebrink and Melody King. As Zeno-Hamilton tells it, she had been volunteering out of town for many years before she decided to start her own organization closer to home. She knew that the Meals on Wheels program was closed on Thanksgiving Day, so she sent out requests for referrals and got an overwhelming positive response. Thanks to Give started out small in 1999, delivering 60-some meals that first year. These days, the labor-intensive operation serves close to 200 meals to an estimated 120 households. By 2012, Zeno-Hamilton was looking for someone to take over, telling The Union she hoped to find someone with the energy and youth to keep the project alive. While several people did come forward in the last few years, a change in leadership never quite worked out, she said. But at the end of last year, Hannebrink and King, who already volunteered for Thanks to Give, expressed an interest. Zeno-Hamilton admitted to feeling some trepidation when she reached out this September, afraid they might have changed their mind. “They were absolutely on board,” she said with a smile. The sisters had been delivery drivers for two years. Hannebrink also had prepped food one year. Zeno-Hamilton said that after so many years, she automatically goes into prep mode and now is trying to translate that instinctive knowledge into instructions for her successors. The whole process typically starts in September when she starts contacting donors, volunteers and organizations for referrals, she said. SPD is “wonderful” about supplying food at a substantial discount — turkeys, stuffing, mashed potatoes and gravy, cranberries, green bean casserole, rolls and butter, and pumpkin pie. Foothill Flowers does the same for the bouquets that go to every household. There’s a lull until the beginning of November, which is when she starts to kick into gear. In all, about 40 to 50 volunteers are needed, between delivery and assembly. “We end up spending a good three days putting the referrals up into the routes,” Zeno-Hamilton said, explaining she tries to keep it to four to six households per driver, all in the same area for convenience. She estimated there are typically about 100 to 120 households. On the Wednesday morning before Thanksgiving, all the meal fixings including 15 to 18 pre-cooked turkeys are picked up and hauled to the Veterans Memorial Building in Grass valley. That evening, six to eight volunteers show up and carve the turkeys and assemble the bouquets. The next morning, a crew of more volunteers shows up to assemble and package the meals starting at 7:30 a.m.
At 10:30 a.m., the drivers start arriving. “We always encourage them to take the time out to visit, to have that sweet little moment,” Zeno-Hamilton said, adding that often, shut-ins are isolated and lonely. All of the meals get delivered between 11 a.m. and 1 p.m., giving the drivers plenty of time so they don’t feel rushed. How involved will the founders be, after this year? “We think it might be fun to show up at 10:30 and drive,” Zeno-Hamilton said after a brief hesitation. “We haven’t spent Thanksgiving with family for years,” Hamilton said. When the deliveries and clean-up are all done, they usually head to a friend’s house for a meal — and another friend always leaves them a pumpkin pie. “Early on, the first few years, we were delivering about 60 meals — it was easy,” Zeno-Hamilton said. But as it grew, preparation and clean-up became more time-consuming. “We’ve been bad about delegating,” she admitted. The siblings already have instituted some changes. For one, they have partnered with nonprofit EA Family Services so that any donations made will be tax-deductible. Also new this year, a Girl Scout troop is making cards to go with the meal deliveries. This week, the sisters spent some time huddling with Zeno-Hamilton to prep for the big day. “It’s just a fantastic way to kick off the holidays, to give back,” said Hannebrink. “And do it as well as Nancy, that’s the intimidating part,” Hannebrink laughed.